Brownies are one of our go-to treats, especially because of our amazing Brownie Mix. With our USA Pan, this is easier than ever! Plus, if you love corner brownies, this is the treat for you- it results in only corner brownies! How should I store my Brownie Bites? We recommend storing in an airtight container between layers of parchment paper (#1153). In addition, place a slice of bread on top to keep the brownies soft. But, if you want to store your brownies for a longer period of time, wrap them individually in plastic wrap and store in the freezer. When you’re ready for a treat, simply unwrap it and microwave for 20 seconds to ensure it’s defrosted. Mint Frosting. This can be done using our Buttercream Frosting (#8126) and Mint Extract. Simply frost the top of your brownie bites. You can add green food coloring to go the extra mile! Chocolate Chips. If you want extra gooey chocolatey goodness, adding chocolate chips is a great idea. Chocolate lovers unite! Mint Extract. This is a delicious and simple way to step up your brownie game. Nuts- pecans (#1292) or walnuts (#1293). This one isn’t for everyone, but for those who love it- we support you! If you are a fan of corner brownies, then we promise you will LOVE this! 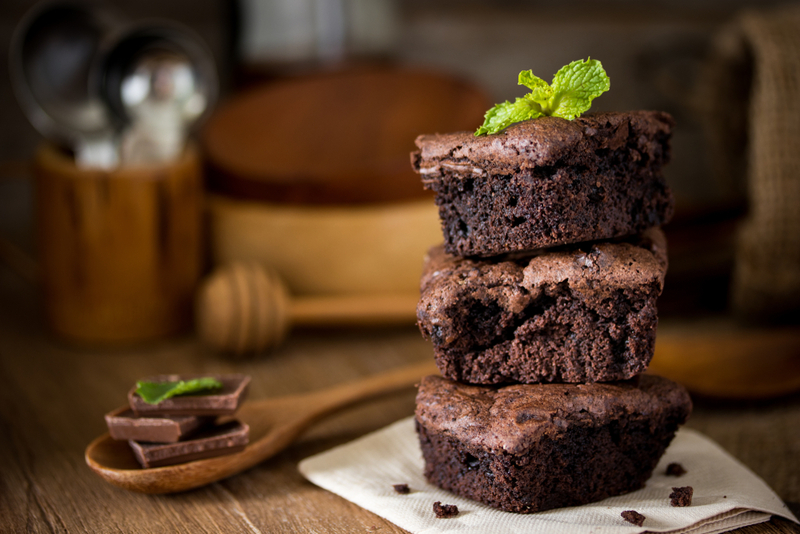 This treat is made easy with our Brownie Mix and Brownie Bite Pan. Slowly add hot water to other ingredients while blending with mixer until smooth. Add nuts and/or chips as desired. Fill each well using a cookie scoop (#3838). Bake for 20 min at 350F. Once done, take a butter knife around the edge of each well. Then, place on acooling sheet (#1145). Optional: Add mint frosting once they are cooled.